I finally got around to asking our neighbor, Judy, which pie recipe she uses for her Kentucky Derby parties. She said her favorite is “My Kentucky Derby Dessert” from Allrecipes.com, and that she likes it even though it overflows from the pan! Judy is pretty laid back about such things. I however, am not. So I made the pie but scaled the recipe down to 2/3 of the original. 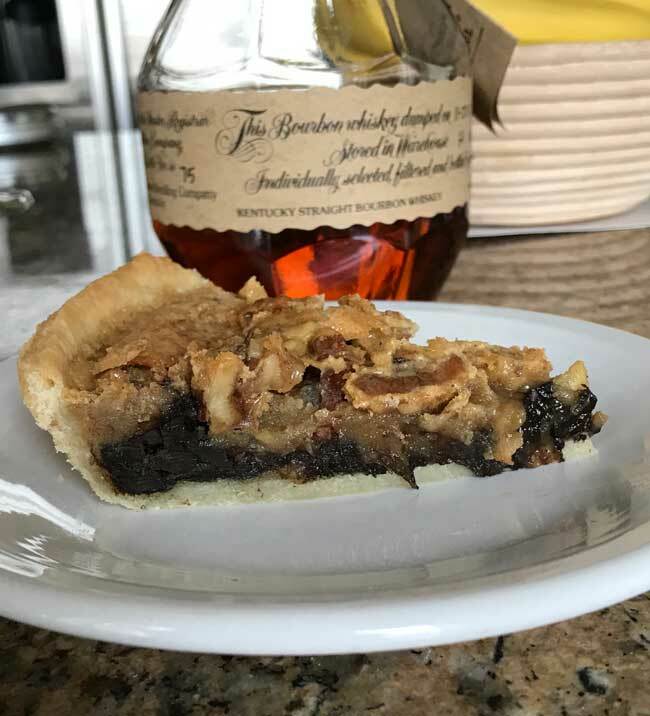 Interestingly, 2/3 of that recipe (minus the oil, which no one uses anyway) turns out to be almost exactly the same as a traditional Nestle Toll House Pie, but with a little added bourbon. The recipe is pretty flexible. You can use pecans instead of walnuts and chocolate chunks instead of chips. 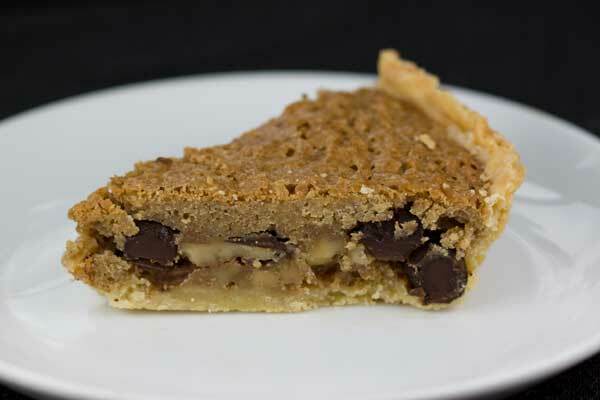 The pie in the photo above was made with Trader Joe’s brand chocolate chunks, and as you can see they melted more than the chips did. 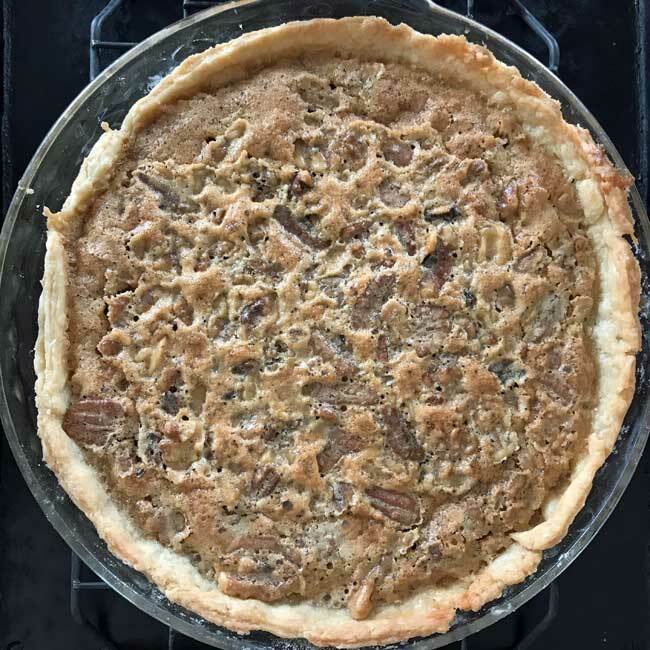 This version of the famous Kentucky pie calls for pecans instead of walnuts. Unlike some recipes it does not call for corn syrup, so it's a little stiffer and denser. Preheat oven to 325 degrees F Have ready a 9 inch dish pie dish lined with unbaked pie dough. Also, put a rimmed baking sheet in the oven and let it preheat. Baking the pie on a hot cookie sheet will help the bottom cook thoroughly. In a mixing bowl, beat the eggs with an electric mixer until foamy. Beat in the bourbon and vanilla. With a heavy duty scraper or large spoon, stir in both sugars and the flour until blended, then stir in the butter (and salt, if using), followed by pecans and chocolate chips. Pour the filling into the unbaked crust and bake for 45-50 minutes or until golden brown. Let cool for at least 15 minutes, then serve warm or at room temperature. You can use softened butter or if you prefer you can brown the butter for extra flavor. Wow, that makes me happy. Both of the recipes were good, but we did prefer the first one. It was soft enough to eat with a fork, but stiff enough so that you could cut it into squares. Another thing I forgot to mention was that with less butter and regular sugar, the flavor of the bourbon came through a bit more. While neither version is super boozy, the first one had a hint more bourbon flavor. My husband is from just outside of Louisville and he got angry (unusual for him) when I started looking up Derby Pie recipes for our KY Derby Party last weekend. He insisted I use the recipe his mom always made, which appears to be the basic recipe you referenced. The pie was a huge hit at the party. He even suggested later that we cut half of the pie like normal but make little squares out of the other half. Sounds like great minds thinking alike!